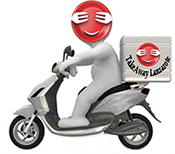 Salads - Takeaway Lanzarote Delivery There are 5 products to choose from. Takeaway Lanzarote - Restaurants Playa Blanca Lettuce , pepper , avocado , radish , pinion and goat cheese. Takeaway Lanzarote - Restaurants Playa Blanca Lettuce , egg , parmesan , salsa worcestershire , toasted bread , chicken ,lemon juice. Takeaway Lanzarote - Restaurants Playa Blanca Salmon , lettuce , tomato , carrots , red onion and toasted bread.